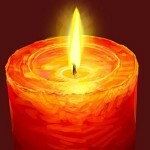 Free Candle Spells | Welcoming Coventry Creations to Free Candle Spells! Coventry Creations started the way all ventures begin, as a vision. Jacki Smith wanted to make a difference. It started with her own life, but she rapidly saw that others were struggling just like her and she set herself to find an answer. She found that we all want, love, money and to do it our way. So she let her vision become a business that offered tools that would help people create their own reality. 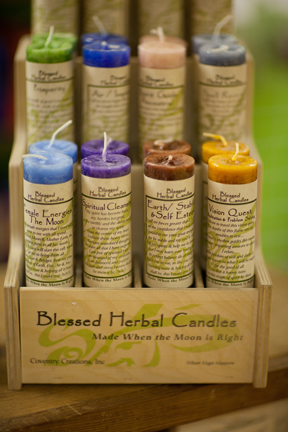 In 1992, Jacki created her first Blessed Herbal Candles. She blended skills from her diverse interests in computer graphics, poetry, Wiccan studies and herbalism and when she picked up a book on how to make candles her path was clear. The rest, they say is history, but oops, herstory. Within a years’ time Jacki’s vision out grew the cozy little basement. She moved the whole operation to a suite of spaces in a neighborhood business district in Detroit. Three incarnations later, the 2011 Coventry Creations is currently residing in Ferndale Michigan enjoying a small light industrial neighborhood. 2012 will be Coventry Creations 20 year anniversary and combined with Jacki’s book release, Coventry Magic, Candles, Herbs and Oils, it will be a year of celebration. Coventry has a presence on the internet, expanded to markets outside the New Age and has done some automating within their walls to better serve their customers. 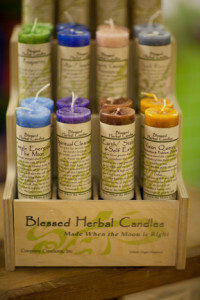 Yes the candles are still made by hand and when the moon is right, that will never change. 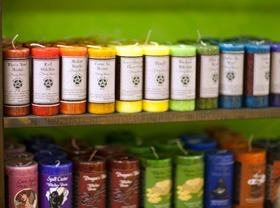 Visit their site at www.coventrycreations.com and view and purchase some of the wonderfully fragranced magickal candles that Coventry Creations has to offer.